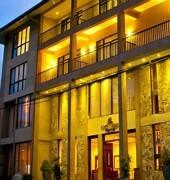 Oak Ray Regency Hotel is located in Gatambe, just below the Mahaweli River border, only 10 minutes drive from Kandy city centre, very close to Kandy Royal Botanical Gardens and with easy access to some of the popular spots in the area like Embekka Temple, Wales Park and Hantana Mountain. Each air-conditioned guestroom features private balcony and offers satellite television, mini bar, heater, ceiling fan, telephone, coffee and tea making facilities, safety locker, hairdryer and private bathroom. The in-house restaurant offers views of the surrounding and serves local and international dishes. The bar serves a selection of refreshing beverages. Additional facilities include an outdoor pool, parking space, wedding and conference facilities and foreign currency exchange. 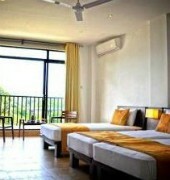 The hotel is approximately two and a half hour drive from Bandaranaike International Airport.